Adam: Thanks again for taking the time to go behind the brand. First things first, though, what is something about you that many people who follow you don’t know? Kristen: I have a BS in Chemistry and a Masters in Environmental Management and spent three years working in Washington DC on marine conservation and public lands issues before starting Bearfoot Theory. Kristen: Back in 2013, during my third year of living and working in Washington DC, I was eager to move back West so I could be near family, friends, and the mountains. I was searching high and low for a job, but I was struggling to find the right position. At the same time, I was spending a lot of time daydreaming about traveling, and I started researching career options that would combine work and travel – from working concierge on cruise ships to teaching English abroad. One day, I stumbled on a few websites, including Nomadic Matt and The Blonde Abroad, where they talked about travel blogging as a career. I had kept a travel blog for fun during a three month trip to Indonesia a few years prior and really enjoyed it, so this sparked my interest. Kiersten, the founder of The Blonde Abroad, was offering a one-on-one travel blog mentorship program, and I signed up without hesitation. Over the next few months, I learned the basics of branding, social media, writing blog posts, and making money online and poured every extra waking hour into my blogging education. Then in April 2014, I quit my DC job, moved to Las Vegas and launched my adventure travel blog Bearfoot Theory – named after the Grateful Dead dancing bear tattoo I have on my foot. I knew it would take some time before things took off, so I got a part-time job at REI, which gave me the opportunity to learn about gear that I could write about on my blog. Six months later, I spent three weeks hiking the John Muir Trail in California, and I shared that experience on social media and my website. This really helped my initial growth on Instagram and my blog. Soon after that, I landed my first brand collaboration – a $50 sponsored post on my Instagram channel promoting a camp mug. Adam: What advice do you have for those interested in working with influencers? How do you decide who to work with? 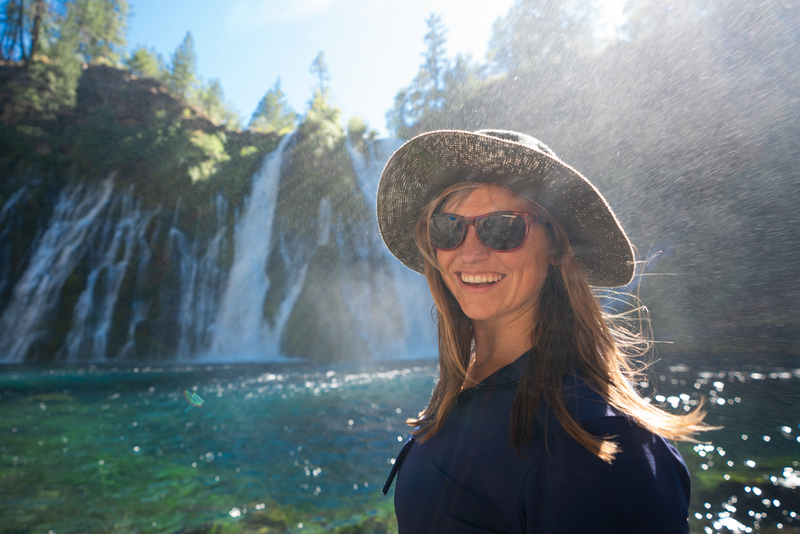 Kristen: I We choose to work with brands that align with our mission to empower everyday people to get outside, live more adventurously, and recreate responsibly. This means we only work with brands that are making high-quality outdoor and adventure travel gear that we would personally use and purchase ourselves. I ask myself, if my readers purchase this, are they going to be 100% stoked on the product? If not, then we pass. Successful influencers may receive multiple brand pitches a day, so as a brand, make sure your products align with their mission and the types of products they’ve promoted in the past. Also, know what your budget is. If you want to work with an influencer that has a significant following, chances are they will not work for free product. Finally, make sure the influencer is legit and their following is real. It’s not uncommon for people to pay for followers and scam the system. Ask for examples of previous campaigns or for a media kit and make sure they can deliver on their promises. Kristen: I First, your audience is everything. Respond to their comments and messages and make them feel valued. Without them, your role as an influencer isn’t worth much. Next, work hard, be patient, and be an open book. Learn to take great photos and soak up as much information as you can about how to improve your craft. You have to be in it for the long haul – don’t quit if you feel like it’s not happening fast enough, it takes time to build a brand. Also, start small – rather than approaching your dream brand right away, look for small start-up brands that are on your level and slowly build up your resume. Kristen: A lot of people think being an influencer means gallivanting around the world and simply taking photos of yourself. Easy breezy. Maybe it’s that way for a select few, but I think the vast majority of successful influencers are hustlers who work like crazy behind the scenes. It’s not about you, it’s about your audience. Being relatable, approachable, and professional are key aspects of building a successful personal brand. Kristen: I’ve always looked to my dad for leadership advice. He has owned multiple businesses, and I’ve always admired the way he respects and values his employees. He taught me to lead by example and treat others the same way I want to be treated. Kristen: I’ve been extremely fortunate to build an entire career around my passion for hiking, traveling, and spending time outside. Hiking is a form of meditation for me, and it’s when I get some of my best ideas. I didn’t grow up spending a lot of time hiking and camping. Rather, I picked up those hobbies later in life and found that learning those new skills and pushing my own boundaries has helped me become a stronger, more confident person. That’s part of the reason why I started Bearfoot Theory – to encourage others to get out, learn new skills, and explore this beautiful world we live in. I also love seeing live music. It’s my escape from work and technology and gives me a chance to let loose and feel free, which is something I think we all need. Kristen: We live in a world where many people’s actions are dictated by fear of failure. Being an influencer or any kind of business owner means taking a risk and putting yourself out there, knowing that it might not work out. The thing I asked myself was “what’s the worst thing that could happen?” In my case, it was that my blog wouldn’t take off, and I’d simply have to go back to a similar job to the one I was in. Realizing that I didn’t have much to lose helped fuel me and allowed me to take the leap.